L/R: Ms Maria Helena de Senna Fernandes, Director – Macao Government Tourism Office; Mr. Li Jianping, Director of Asia Tourism Exchange Center of China National Tourism Administration, Dr. Chris Bottril, Vice Chairman – PATA; Dr. Alexis Tam, Secretary for Social Affairs and Culture of Macao SAR Government; Dr. Mario Hardy, CEO – PATA; by Mr. Ip Peng Kin, Chief of Office of Secretary for Social Affairs and Culture of Macao SAR Government, and Datuk Seri Mirza Mohammad Taiyab, Director General – Tourism Malaysia. 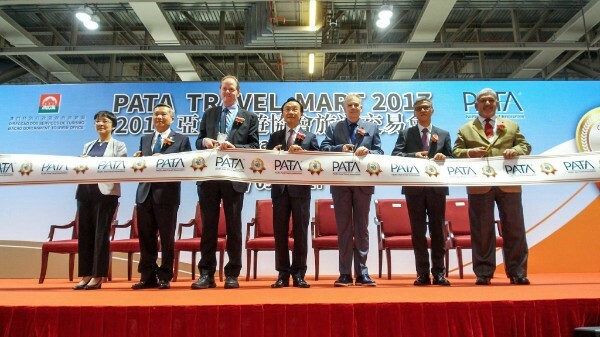 The 40th edition of PATA Travel Mart 2017 (PTM 2017), hosted by the Macao Government Tourism Office (MGTO), has attracted 1,131 delegates from 66 global destinations. The delegate numbers embraced 460 sellers from 252 organisations and 37 destinations, along with 293 buyers from 281 organisations and 51 source markets. The Pacific Asia Travel Association (PATA) also was pleased to welcome 37 young tourism professionals including PATA Student Chapter members from Hong Kong Polytechnic, Singapore Temasek Polytechnic, China Zhejiang Gongshang University, University of Guam, Nepal, Macao SAR and Canada Vancouver Capilano University. PTM 2017 officially opened in Macao SAR on September 13.